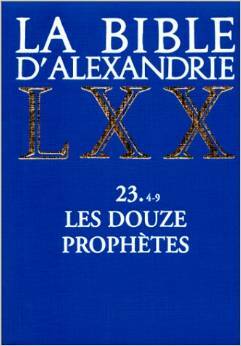 For the past day and a half now, I have been working my way through an important resource on the LXX text of Jonah: La Bible D’Alexandrie: Les Douze Prophètes. This is a resource I had attempted to get my hands on early in my studies but did not have access to until yesterday when a friend graciously emailed me the relevant pages. Dans d’autres cas, l’intention du traducteur ne semble pas d’ordre stylistique mais plutôt théologique: pour exprimer la “crainte,” le TM n’a qu’un verbe, yar’, qu’il s’agisse de la peur éprouvée par les marins (1,5, 10) ou de la crainte de Dieu chez Jonas (1,9*); la LXX, quant à elle, emploie phobeomai (de sens neutre) dans le premier cas, sebomai (de sens specifiquement religieux) dans le second (p. 123). In other cases, the intention of the translator does not seem to be for stylistic purpose, but rather theological: For example the word “fear,” the MT has only the one verb yar’, when experienced by the sailors (1:5, 10) or the fear of God in Jonah (1:9); the LXX, meanwhile, employs phobeomai (neutral sense) in the first case, sebomai (specifically religious sense) in the second. There’s much more like this and other insights throughout the chapter on Jonah, which makes the painstaking work of translation invaluable. I am hoping that this will continue to be true as I finish working through the Introduction and move into the meat of the translation/notes. This entry was posted in Jonah, LXX and tagged French, La Bible D'Alexandrie, LXX, Translation. Bookmark the permalink. Ha! Thanks for the encouragement Charles. Thesis has slowed down a bit ever since I hit Jonah chapter 2. Dealing with the poetry of the psalm and its translation into Greek will take a bit of time. I suspect I will make swift progress of the rest of the book once that has been knocked out.